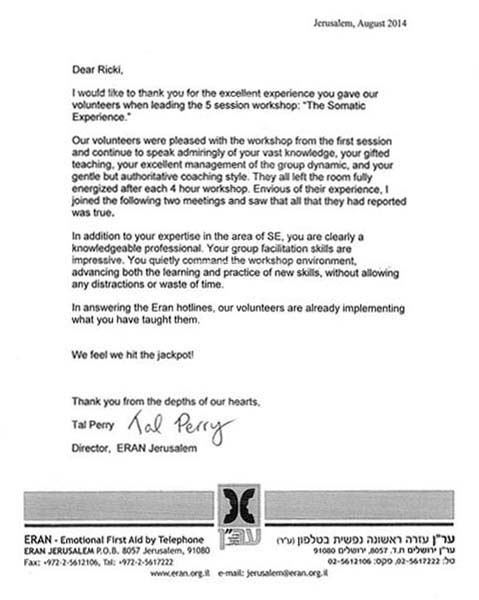 I had the good fortune to volunteer and be chosen for an Somatic Intervention demonstration with Ricki. Accessing an old memory of a house break-in when I was 17, Ricki was able to help me hone in on the panic and fear that I had repressed but showed up consistently in other situations. With one session of SI, I felt I had vanquished the fears that had frequently immobilized me. In addition, on the way home from that day’s training, I was faced with a challenging situation and to my fascination, I met it with a sense of calmness and presence that had previously been lacking. And, I continue to notice these types of situations cause me much less fear and panic. Gently and knowledgeably, Ricki Bernstein takes her students on a journey that helps them discover the wisdom of the body and how to harness it in the service of healing and transformation for those who come to us for help. 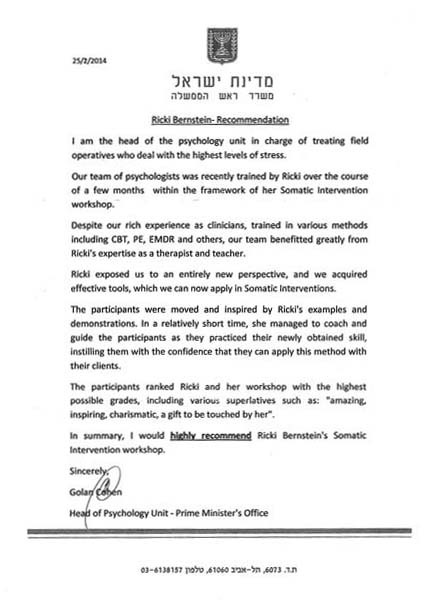 Therapists who have taken Ricki’s trainings or workshops speak of her always with warmth and gratitude for the experience. You have really changed my life with your tender caring, your powerful, penetrating, yet gentle and healing therapy, and your lucid, dynamic, profound and yet humble, accessible teaching, and your ability to take very complex material and give it over piece by piece with words, exercises, and demos so that by the end of course there is an aha, now I know what attachment is, both somatically and cognitively. I had that aha the next day when I had 4 quite amazing sessions with clients. What is so compelling and transformative about Ricki and her trainings is the way she explains the material in such a digestible way. I have been taught many of the concepts before in highly respected academic environments, and never understood it this thoroughly until taking this course. The truest testament of learning is whether you feel able to be able to teach it to someone else and this is the first time I can see I feel confident sharing what I have learned with my patients. Ricki’s style is gentle, noninvasive, respectful, and truly unique. I highly recommend it for anyone who is looking to further their understanding of ​the ​somatic world and learn how to help patients (and ourselves!) in a much deeper way. I have to say of all the demos I have done, this was one of the more profound- and I have never felt more safe and taken care of. It​’s a testament to your style and teaching method that despite this information not being ‘new’, per se, this is the first time that I have heard it in a way that actually stuck. Your way of explaining is truly unique and special. I can see it impacting both me as a person and patient, and as a therapist with my own clients. Looking forward to returning for the attachment training! 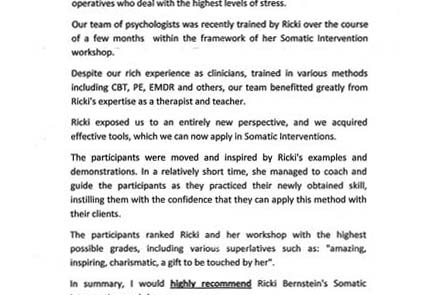 Ricki’s course should be required for therapists treating survivors of trauma! I have been a clinical psychologist (and am myself a trainer and supervisor) for more than 30 years and found this training to be quite enriching and useful. For some time, I have been wanting to learn more about somatic therapies, and I’m very grateful that I found this opportunity. I feel that this short course will have a profound impact on the way I do my work from here on. Ricki organized the course so that trainees could learn about the neuroscientific basis for this work and also experience the somatic approach in our bodies, not just learn on the cerebral level. I appreciate that the pedagogy was consistent with the content. 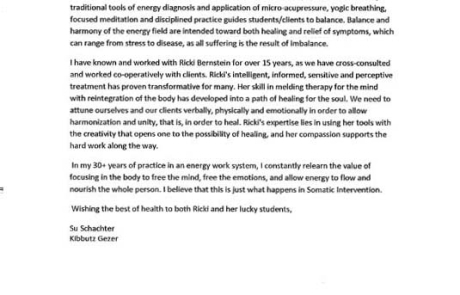 Ricki is a truly gifted clinician and teacher. 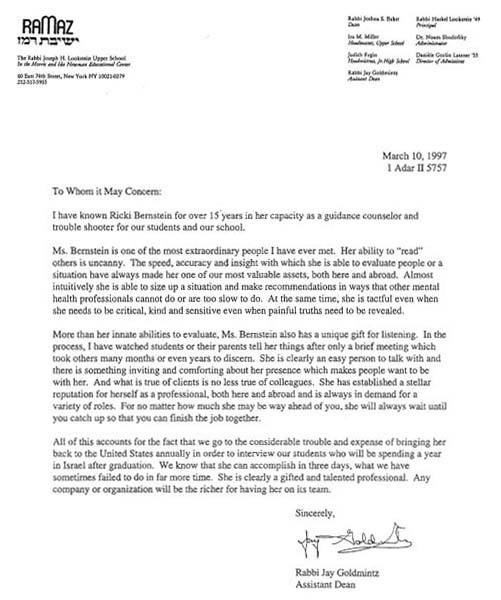 Her wisdom, warmth, and depth of experience made all the difference for me. This counts as one of the best courses I have had the privilege to attend. 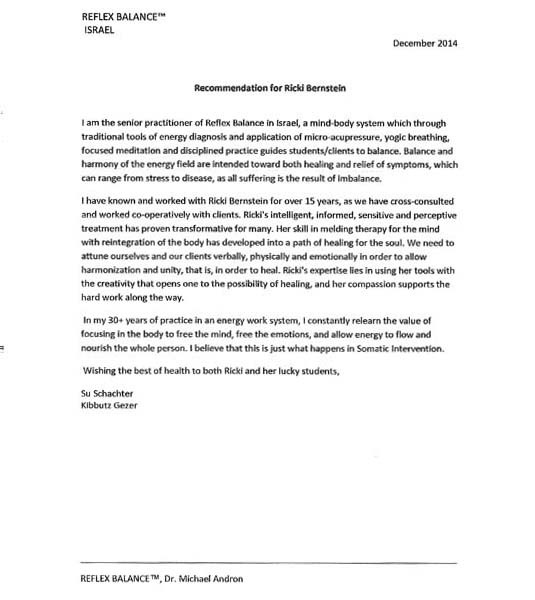 I am looking forward to continuing this learning, and applying the somatic approach in my work . What an enriching week you gave us at the end of August. I have already begun to introduce concepts and sensitivities into my work with clients. And – what is special for me after a training – not from a place of planning to introduce things that I have learned, but from a place of enlarged perspective that has made me aware that clients need these things from me. The Somatic Intervention training, although intense, was really excellent. 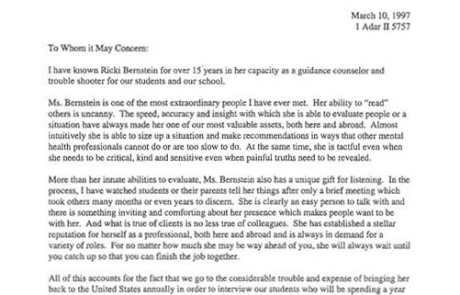 Ricki Bernstein (creator of this unique, specialized model who gave the training) is not only a brilliant practitioner, but is also a stellar teacher. To answer the question on her flyer, yes, it’s this somatic piece that is missing from my practice, particularly with survivors of trauma- without a doubt. This 4 day training, which incorporated lectures, live demonstrations and experiential exercises, gave me a good glimpse of the power of using Somatic Interventions. I am just now understanding the vital role of the body/sensory experience, how entrenched it is in traumatic events and how significant its role is in the recovery and healing process. How can I now NOT use this in my work with clients? I do not think there is any way for me to go back as a therapist. To do so would mean leaving out such an important, huge dimension, which seems so obvious now: the “voice” of the body and the sensory experience must be expressed, its story told and unlocked by way of movement and attuned-to sensation. Ricki’s work is so deep, filled with such careful, finely attuned nuances, and with such sensitivity to the sensory experience and body’s language and expression. This is clearly the way to go if one wants to directly reach that primitive ‘stuff’, that reptilian brain. Somatic Intervention goes beyond verbal expression. I feel I must tell you everyone was talking about how great your course was, and that they would like a followup. I know I’ve already expressed how transformative your training was for me. What I did not say, or recognize at that point, was how incredibly it will impact everything I say, do, feel and think in all aspects of my life. As I sit here, writing this email, I just finished a session with a client that blew my mind! This would not have been the case, had I not known what I know today, about trauma and its affect on the mind, body, and soul. I feel humbled and inspired. It is a pleasure to observe the way you work with us students to create a warm, supportive and nurturing environment that facilitates being able to go inside and see what is there. You are also a great model for how to deal with client questions. –Your professionalism, maturity, attention and sharp concentration. I felt like you were always there ready for anything, 100% each time, the same as the previous sessions. Only technology interrupted things occasionally. –A reassuring and calm positivity, without being sappy or unreasonably optimistic. Didn’t attempt to gloss things over.